Saleh Majid owns an electrical supplies shop in Baghdad’s busy Shorja market area. And every day after the close of business, he takes all the money he has made that day home with him; he won’t deposit it in any Iraqi bank. This is because Majid had been a customer of Iraq’s Warka Bank for Investment and Finance, the country’s largest privately owned bank. In early 2012, the Warka Bank was declared insolvent by Iraq’s Central Bank and placed under management appointed by the Central Bank. “When the bank loses its capital, fails in its financial operation and faces an unsolved problem, the Central Bank according to its law, intervenes as a guardian and appoints a new temporary administration to run this bank,” the deputy governor of the Central Bank, Mudher Saleh Kasim, told news agency Reuters at the time. Unfortunately for customers like Majid, this meant they lost money. Majid was only able to get about 20 percent of his savings back. The situation was a fraught one: some bankers accused the Iraqi government of manufacturing excuses to attack Warka Bank because the success of the private bank was threatening business done by state-owned banks. People are reluctant to deposit money in Iraqi banks for several reasons, says deputy Minister of Finance, Fazil Nabi, who actually recently submitted his resignation due to unresolved issues between Baghdad and semi-autonomous region of Iraqi Kurdistan. Khalid al-Wasiti, a university professor, doesn’t have a particularly positive story to tell either. Al-Wasiti wanted to deposit his money with a bank because of a high rate of robbery in the area in which he lived in Baghdad. He deposited his cash at one of Iraq’s two major state banks – these are Rafidain and Rashid – in the hopes that his money would be safer in a state-owned and operated enterprise. According to the Iraqi Central Bank’s website, the country has 23 privately owned banks, seven government-owned banks and nine Islamic banks, as well as around 16 foreign banks, to choose from. To try and resolve some of locals’ issues with local banks, the Iraqi parliament’s committee on finance says it is planning a law to protect deposits. “Most of the privately-owned banks welcome the committee’s suggestions,” says Muslih al-Waeli, of the privately owned North bank of Iraq. Waeli also suggests that the government create some kind of organisation that would be able to secure locals’ bank deposits. 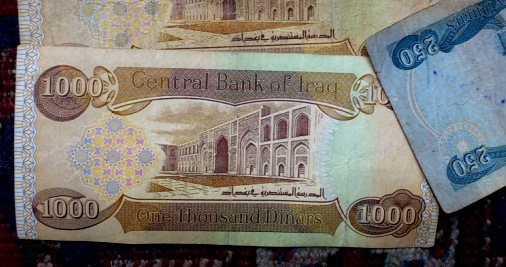 It remains clear though that Iraq’s banking sector still leaves a lot to be desired. In March of 2013, a delegation from the International Monetary Fund, or IMF, met with representatives from the Ministry of Finance and the banking sector.